Ted Chiang made carefully balanced points both for external-recording-as-memory, and against. In the end, I think, he is for it. Here is a condensed version of his speech. Even as we might think that a video of our life would never be used as a memory substitute but only as aid, it won't be so. We have been outsourcing our memory for millenia in every way we could. Ancient Greek philosophers complained that writing has corrupted people by weakening their memories; no one could recite thousands and thousands of lines of Illiad or Oddyssey anymore. Since then, outsourcing of memory has only picked up pace. Young people don't remember their own or other people's phone numbers, because they rely on having them stored in their own phone; and we are less and less inclined to commit facts to memory, because we can always Google them. So if we have a continuous video of our life, we will come to rely on it instead of our internal memory; it will become, in fact, our memory. But our memory is not a documentary; it is a web of narratives that get edited every time we remember something. Recalling past events adds another layer to them every time. It also distorts those memories. Most of our memories are not of true events, but some kind of version that pleases us or adds meaning to our lifes; it may help us see our life as having a narrative arch, to confirm the idea that life is getting better. Sometimes it's good to hold on to a thought that we are getting better at something, because without this illusion we might not have strength to go on. In one study women were asked how many common interests they shared with their partner, and how much time they were spending together; then they were asked those questions again 10 years later. In addition to recording women's answers, the researchers also asked women to remember how they answered those questions 10 years ago. It turned out that most women thought they spent as much time together and shared as many interests with their partner now as 10 years ago; but this was in fact not true -- the difference in answers from the two time periods showed decline in closeness and common interests. But we lie to ourselves and tell ourselves that we have always enjoyed the same level of closeness, because to think otherwise would disappoint us in our illusion that our love is growing deeper over time. Ted Chiang gives a speech on lifelogging. More pictures from ArmadilloCon 2014 are in my photo gallery. As we edit our memories, we are also eliminating those memories that are inconsistent with the way we see ourselves. 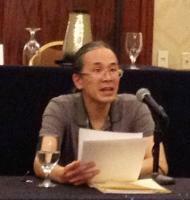 Ted Chiang gave two examples of famous science fiction writers who had been on the giving or receiving end of it. One of them recalled in an interview the final months of his father's life, and named the radio station his father listened to; later other people pointed out that this radio station had not yet started broadcasting that year. The fact checkers even found an obituary for the writer's father in old newspapers, and it turned out the father died two years later than his son thought. While you might wonder how it is possible to misremember the year of your father's death, the writer, when confronted with this fact, gave an explanation. Since his father died just a few months before he started college, and the freshman year of college was a very exciting time for him, his memory simply refused to put those two events in one year. The emotional "tone" of those events was much too dissimilar for them to have happened just months apart. Ted Chiang told a similar story about another writer, whose mother beat him with a rope as a child. Decades later it turned out that his mother didn't remember doing any such thing. She denied ever doing that. Again, the way this could be explained is that back in the early 20th century (the time of this writer's childhood) it was acceptable to beat children, but a few decades later it was far less so. So his mother, thinking of herself as a good mother, unconsciously edited out of her memory the episodes of beating her child. But if we edit out our memories in which we have hurt others, then we are not doing justice to those people; we are denying them their experiences. Similarly, the ruling elite of a nation might be denying the experience of suffering to the groups in the nation that they had oppressed. The notion of justice -- both interpersonal and on world scale -- requires that we remember our wrongdoings. This was Ted Chiang's conclusion, and this is why he thinks, after all, that lifelogging would be a step in the right direction. Questions and discussion with the audience. Audience member. What if having a video of all moments of our life would prompt us to live our life as if we are creating a story -- which is, after all, what we are doing in the video? When I was in college I deliberately went and did things, had experiences, to have something to write home about. Friday afternoon would come and I would think, oh, I haven't done "anything" this week yet (out of the ordinary) -- I should go be interesting for a couple of hours now! I (Elze) chimed in saying that people do that kind of thing on social media even today. They go to events and do activities they might not have done otherwise to have something to post on Facebook. Ted Chiang agreed that people carefully curate the profile they present to the world on social media, but it doesn't mean they would deliberately try to be a better person so as to have a better record in their life video. Facebook / Twitter streams is what we show to friends, and so we pick and choose the events we display; but a lifelogging video is private (assuming, for the sake of conversation, that privacy and security issues have been solved), and if we don't have to worry about anyone seeing us being mean, we might not have an incentive to be better. My take: I don't know if I agree. Most of us want to view ourselves as a good person, or at least as a person with some good qualities (high achiever, intelligent, etc). We might actually be motivated to craft our life stories in such a way that the record of our life would contain mostly the justification for our high self-esteem. Q2. Doesn't forgetting play a big role in getting over a trauma? Audience member. Forgetting can be very helpful in getting over a trauma; especially forgetting violent events. If we can't forget anything, if our video is there, we might be tempted to go back to those traumatic moments and never make progress in healing. Ted Chiang responded that these days researchers are working on medicines that help us selectively forget, allowing one to heal from PTSD. My take. I'm not sure where he was going with that -- maybe that those medicines can be so powerful that existence of record of violent events won't even be an issue? I don't see that a person would inevitably go back and review memories of traumatic events -- can they just not resist torturing themselves? But it may be that the very knowledge that there are "tabu" segments in your life video would constantly remind you about them. Q3. Doesn't forgetting go a long way towards forgiving? Audience member. A certain amount of forgetting goes a very long way in maintaining good relationships with your relatives. When you meet and talk with them a few times a year, it helps if you had forgotten things they did that made you very angry, or hurt you. Ted Chiang responded that it would be even better if that person remembered how they wronged you, and be motivated not to do it again. Q4. What if your memories are hacked? Audience member. What happens when a hacker hacks into the record of your memories? Surely it will happen, because any and every technology that has ever existed has been hacked into. Ted Chiang. Even if hackers modify your own memories, that wouldn't be the end of the world for you, because any kind of public event would be recorded by at least some other people. So you could compare your memories with theirs, and restore the truth. My take. Yes, but it doesn't address that you might not even know your memories were tampered with, and so you won't be compelled to compare them with others' memories; also, what about somebody tampering with recordings of a private event, that no one else has a recording of? And what about a hacker revealing your private memories to the world? Actualy, Ted Chiang said at the beginning, "Let's assume that privacy and security issues have been solved, and just talk about how lifelogging will affect the memory", but that's such a big, unrealistic assumption that it's basically meaningless. Q5. Who has control over shared memories? Audience member. If everything you do is recorded in the continuous video of your life, then any movie you've seen will also be in it. So who will own that part of the video -- you or the movie studio? Whenever you wanted to rewatch a movie, you wouldn't need to rent or stream that movie again -- you would already have a recording. (This assumes that a video of something playing on a movie screen would be as good a quality as the original, but maybe that's not a stretch.) So how would movie studios fight the loss of revenue? Ted Chiang pointed out that even now you can download a movie from the torrents as soon as it comes out on the screen, so clearly people are doing a very similar thing now, and movie studios haven't collapsed yet, and they can't really do much about pirating. Audience member. Still, internet providers and other entities try to put an end to torrents, they sue users, block piracy sites, etc. ; but nobody should be able to do anything legally about content that rightfully belongs to you, being the recording of your life. Would the movie studios try to enforce clauses that let you re-watch that part of your life video for your own entertainment, but not show to anyone else? There are many questions there. Another audience member. Related question: to who will a recording of private moments between two people belong, in case they separate? What about the right for either person to show it to a third party -- will the courts have to decide who has such a right? Q6. Can police confiscate your memory? Audience member. About the 5th amendment. Police can confiscate your computer records, video records, or any kind of records if they are needed in an investigation of a crime; but if the recording is literally considered to be your memory, they might not have a right to confiscate it. Requiring that you give up your memory would go against the 5th amendment: it would be the same as forcing you to speak. How would the laws, or constitution need to be rewritten in such a case?